Mild Safely and quickly to the oil does not harm the makeup. Portable.Easy to use. 100 Sheets/Box face oil absorbing Paper Makeup Face Clean Paper Green Tea Scent. 100 sheets/box, ace oil absorbing Paper. 1 Box Oil Absorbing Paper(100 sheets). Item Type: Oil absorbing Paper. Ingredient: Green tea essence, 100% primary wood pulp. Avoid acne and skin irritation. Color: As the picture shows. Portable and easy to use. Make-up before you wipe the face, can make more impact, natural moving. 1 Box of Oil Absorbent Paper(90 Sheets). Type: Oil Absorbent Paper. Quantity: 90 Sheets. Natural native wood pulp, double effect, drive out big oil fields. Soft and gentle to the skin, easily absorbing excess oil. Pattern: As the picture show. Color and Style: As the picture show. Color and Style: As the picture show. Pattern: As the picture show. • These oil blotting sheets are softer than paper, so that these sheets can be used easily around your nose and other areas of your face. Very soft tissue with good sebum absorption. • Apply one sheet of film onto skin and gently press to absorb excess sebum. 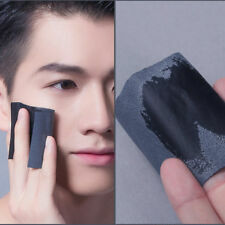 This Oil Absorbing Paper for effectively face oil blotting. 1 Bag Face Oil Absorbing Paper. Easy to use and portable. Quantity: 1 Bag (90 sheets/bag). Note: The real color of the item may be slightly different from the pictures shown on website caused by many factors such as brightness of your monitor and light brightness. The facial tissue is smooth and contains green tea extract, giving the skin a natural feel, reducing the skin burden and keeping the face clear and fresh. Cleanse redundant oil of skin, reduce the burden on your skin and keep the makeup. Model Number:Chamomile oil absorbent paper. Item Type:Oil Absorbing Sheets. 1 x Box of Oil Absorption Paper (100pcs). - Bright on both sides to dry the oil. Due to the difference between different monitors, the picture may not reflect the actual color of the item. Features: - Portable and easy to use. Take one sheet and gently blot face to absorb oil. Soft blotting sheets to absorb excess oil on face. - How to use.